Coxa vera — which is a decreased angle of inclination of the femoral neck. Genu varum — in which the distal third of the femur is bowed medially. 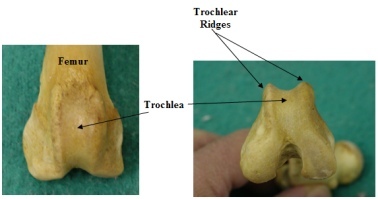 A shallow trochlear sulcus with poorly developed or absent medial ridge. A hypoplastic medial humeral condyle resulting in tilted stifle joint. A decreases in femoral neck anteversion. Intermittent patellar luxation causing the limb to be carried occasionally. The patella luxates at full extension but returns to normal position when released. With the patella in normal position the leg aligns normally. Luxation occurs more frequently than in Grade I. The patella luxates easily. There is slight external rotation of the leg. Many dogs live with this grade for years before progressive arthritis causes more severe lameness. 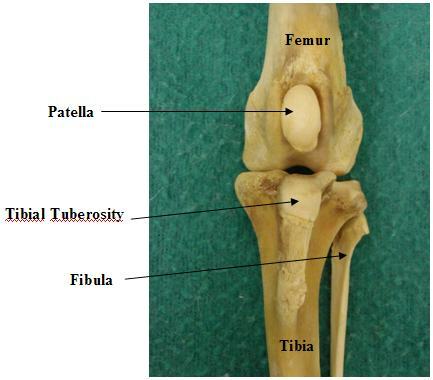 Here the patella is permanently luxated with very noticeable external rotation of the leg. The trochlea shallow or flattened. There is moderate lameness. 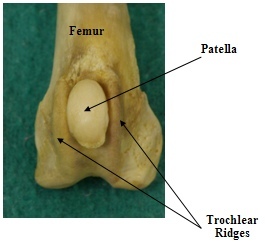 The patella is permanently luxated and the limb may be carried if unilateral. If bilateral the dog may move in a crouched position in the rear end with the limbs partly flexed and severely “toed-out”. Lateral Luxations Lateral patellar luxation is also known as genu valgum. Components of hip dysplasia such as coxa valga (increased angle of inclination of the femoral neck) and increased anteversion (excessive external rotation of the upper part of the femur relative to the lower part) of the femoral neck are seen in this condition. These deformities result in internal rotation of the femur which displaces the quadriceps mechanism and patella laterally (externally). The most common finding is a knock-knee (genu valgum) stance. In mild cases surgical repair may not be necessary. Signs may worsen as the dog gains weight, joint cartilage erosion occurs, the luxation becomes permanent, the cruciate ligament ruptures or hip problems develop. Surgical repair can consist of soft tissue reconstruction or bone reconstruction or both. Post-operative care involves limiting exercise for 3-4 weeks with particular attention to preventing jumping. Post-op pain medication may be dispensed as indicated. Later, physical rehabilitation will be needed.